Top of the League! Saracens take full points again! 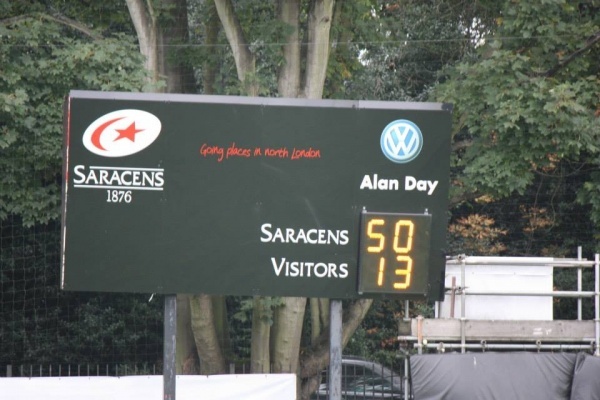 The conditions were perfect as Saracens hosted Hendon at Bramley Road, and it soon became evident that this would suit the home teams style of rugby as they ran out 50 - 13 winners. For the first time this season Saracens started well, with some strong running and unlocked the Hendon defence within the first ten minutes, following a good break from Jack 'Mr Happy' Goldberg, Captain Dom 'Lost The Damn Toss Again' Smart went over in the corner. Hendon responded with a break away try. However, Saracens replyed quickly, and a break and chip from Captain Dom 'Kicks Work Out 1 in a 100 times' Smart, was neatly gathered by Rob 'Mr Evergreen' Eston. Felix 'Also Runs Like A Lion' Brasseur continued his good run of form, also getting his first of two tries after some good interplay between the backs and forwards. Hendon responed though a powerful scrum, leading to a break away down the blind side for their right winger. A further penalty resulted in the half time score being a competitive 21 - 13. After an obviously agressive half time talk from thier coaches, Hendon came out strongly after the break and put Saracens under a sustained period of pressure, eventually leading to Saracens playing with 14 men for 10 minutes. However, the home teams defence was outstanding, finally breaking down the away sides attack and clearing their lines. Having dominated the line-out all day, the forwards enabled play to be taken out of the Saracens half, where the away side barely ever ventured again. Having taken full control, the Saracens forwards provided an excellent platform for the backs to finish Hendon off. Further tries from Rob 'Will Be Hurting Tomorrow' Eston, Felix 'Grrrrrrrrr' Brasseur in additon to Jamie 'I Stopped Moaning When I Got On The Score Sheet' Connolly and Jack 'Even When I Scored I Didn't Smile' (in addtion to an outstanding kicking display) rounded off an excellent performance. Captain Dom 'Damn Cramp Hurts' Smart said; 'Top of the league is a great position to be in after two games, but it's early in the season and we must keep this level of commitment if the forthcoming games'.